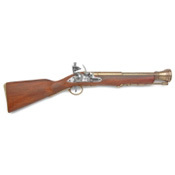 We have a great selection of Replica Pirate Flintlock Pistols and Accessories that includes Pirate flintlock pistols and blunderbuss, German flintlock pistol, three barrel revolving flintlock pistol, pistol dagger, pistol hunting sword, English, dagger pistol, boarding pistol and many others. They are great as pirate props, collectibles, displays and gifts. 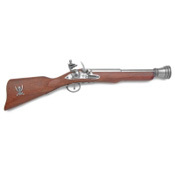 This model gun based on an 1872 French Percussion cap-firing pistol has elaborate engraving running half way down the barrel from the hammer and a uniquely designed emblem on the grip. Features, Length: 14.25", Weight: 1.3 Lbs, Finish: Antiqued Metal-Gray.